Developers Utopian World of Sandwiches are a unique pair, as you may have guessed from the name. They are also quite the love story! 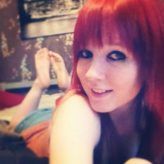 Having decided that ‘the best way to make a game is in the same way that you make a sandwich for a loved one’, Sarah and James Woody embarked on a game developing journey that began with Chompy Chomp Chomp. They even made a game for their wedding – awwww. UWOS have a goal, and that goal is to make ‘games with a purpose’. They say the purpose of Chompy Chomp Chomp is to ‘bring people together’. 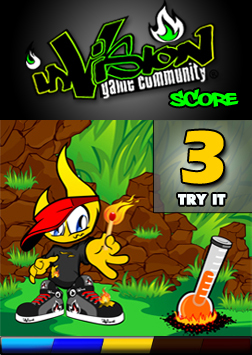 The idea behind this game is to grab a few of your friends, sit on the sofa and play around a television screen. Beer is optional. 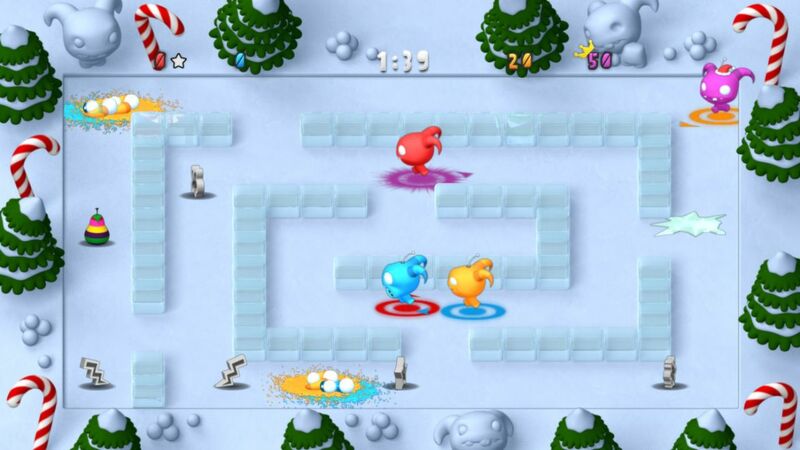 The game itself is simple – you control one of four brightly coloured Chompies, and you must dash around the map chomping either your friends or the Blobbidees that have infested your garden. I’m not entirely sure what a Chompy is. Its big gormless eyes and mouth full of teeth makes it comical and adorable at the same time. Blobbidees are also something of a mystery. They appear to be some kind of fuzzy vermin, governed by their Queen Blobbidee. 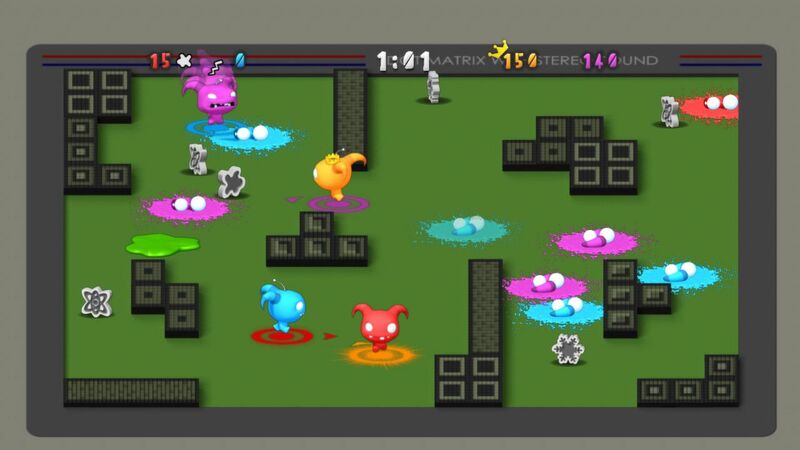 The PC version boasts a single player, in which you must dash after the Blobbidees and change your colour in order to chomp a Blobbidee of the same colour. The Queen Blobbidee, meanwhile, is after a chomp of you. If you attempt to chomp a Blobbidee of the wrong colour, they’ll chomp you instead. Chomp as many Blobbidees as you can to ramp up your high score, and you can include a friend to attempt to up it even higher. The single player, unfortunately, is a little weak. Chasing after adorably fuzzy Blobbidees quickly loses its charm and becomes repetitive. 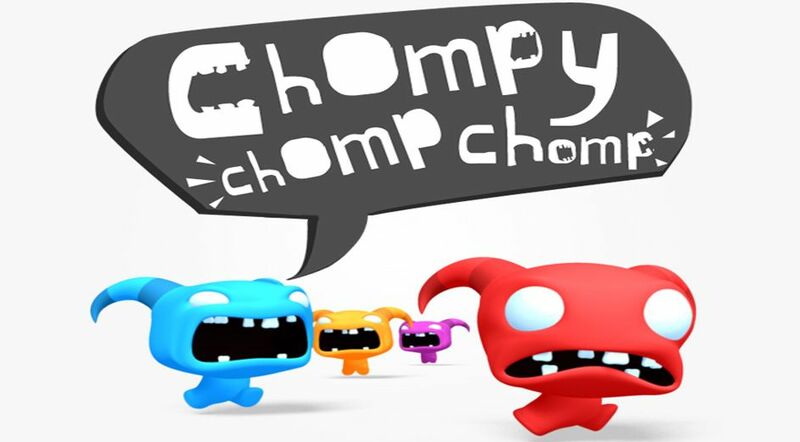 Chompy Chomp Chomp is quite simply made to be a multiplayer, and this comes across strongly when attempting to play solo. 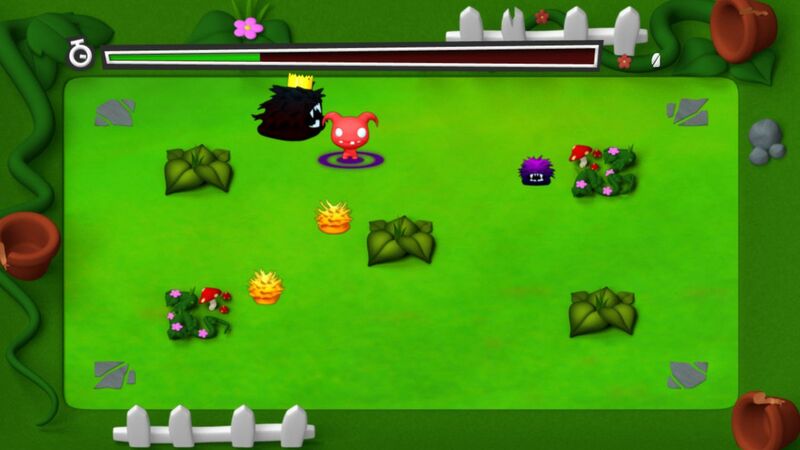 Multiplayer, therefore, is where Chompy Chomp Chomp comes into its own. Moving Chompy Chomp Chomp from the Xbox to the PC has clear limitations in that you can now only play in twos rather than fours. UWOS’ vision of crowding around the TV with controllers in hand remains the games’ ultimate calling. Playing side by side with your Chosen Opponent in battle mode is still hilarious. You and your opponent dash around a maze, along with two AI Chompies. The coloured panel beneath your feet will change at random, and you’ll have to chomp the matching colour Chompy. You’re at once chasing after your Chompy, while avoiding being chomped yourself. Chaos and laughter ensues, in the same way that episodes of Tom & Jerry had you creased with mirth as a child. It’s easy to get completely confused – what colour alien was I again? What colour am I supposed to be chomping? – but this just adds to the fun. When you are chomped, you dissolve into a messy blob of alien with just a pair of eyes looking up at you, before respawning somewhere randomly on the map. You could respawn right under the nose of the Chompy that wants to chomp you, and have to madly dash in the opposite direction to escape. As if that doesn’t sound crazy fun enough, there are also power ups that can shake it up even further. You can decide whether or not to set power ups to ‘frenzy’, and I recommend, for hilarity’s sake, that you do. Poison confuses your Chompy and reverses the directional buttons, fruit can be eaten to give you additional points (because fruit is good for you). The game is far too quick-paced to be able to pay attention to what power ups or pit falls you are running into, however, meaning you’ll be madly firing off whatever you’ve picked up. You’ll quickly realise that you cannot be tactical or organised in your gameplay at all. It is comedic anarchy. You can set your levels to be as long or as short as you like. There are a range of map designs that can be chosen before you play, and they are all considerably different to one another. Some are openly spaced, allowing maximum mad dashing, and some are more intricate and filled with corners and corridors. The latter are the more interesting, although it can be frustrating to respawn in a place where you may be cornered, which can happen repeatedly. It’s far more fun to have to manoeuvre around the map in pursuit of your target, however. The graphics of the game are bright and crisp, and perfectly match with the cartoon-ness of the game. The vivid Chompies and Blobbidees set against dull or white backgrounds works particularly well, and they really pop. The animations are tight and well-made, and it all comes together to make an entertaining experience. Chompy Chomp Chomp was simply made to play in a group. Single player doesn’t have the same chaotic and frantic appeal to it, and there’s nothing more hilarious than dashing after a friend who has just become your target enemy with your jaws chomping. Visually, it is bright and zany, which is in keeping with the quick pace and the farcicality. Utopian World of Sandwiches are currently working on a WiiU party version of the game, which will perfectly suit it. UWOS dreamed of a game that brought people together, and here it is – a game that will have you and your friends doubled over with laughter. The PC keyboard just isn’t big enough for all that fun!